Sea butterflies, scientific name Thecosomata (thecosomes, "case/shell-body"), are a taxonomic suborder of small pelagic swimming sea snails. These are holoplanktonic opisthobranch gastropod mollusks in the informal group Opisthobranchia. They include some of the world's most abundant gastropod species. 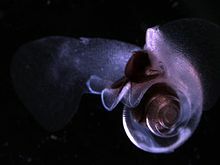 Along with its sister group, the Gymnosomata, this group is included in the pteropods. The validity of this clade is not unanimously established; although it had fallen out of favour for a number of years, recent molecular evidence suggests that the taxon should be resurrected. Most Thecosomata have a calcified shell, whereas mature Gymnosomata do not. These snails float and swim freely in the water, and are carried along with the currents. This has led to a number of adaptations in their bodies. The shell and the gill have disappeared in several families. Their foot has taken the form of two wing-like lobes, or parapodia, which propel the animal through the sea by slow flapping movements. They are rather difficult to observe, since the shell (when present) is mostly colorless, very fragile and usually less than 1 cm in length. Although their shell may be so fine as to be transparent, it is nevertheless calcareous; their shells are bilaterally symmetric and can vary widely in shape: coiled, needle-like, triangular, globulous. The shell is present in all stages of the Cavolinioidea (euthecosomata) life cycle, whereas in the Cymbulioidea (pseudothecosomata), adult Peraclididae bear shells, Cymbuliidae shed their larval shells and develop a cartilaginous pseudoconch in adulthood, and Desmopteridaen adults lack any rigid structure. Thecosomata beat their wing-like parapodia to "fly" through the water. They are holoplanktonic; that is, they spend their whole life in a planktonic form, rather than just being planktonic during the larval stage, as is more commonly the case in many marine gastropods, whose veliger larvae are part of the meroplankton. 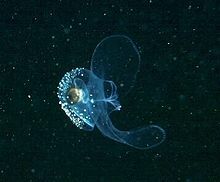 Little is known about the behaviour of sea butterflies, but they are known to have a peculiar way of feeding. At times, they just float along, ventral-side up, with the currents. They are mostly passive plankton feeders, but at times they can be active feeders. They are generally herbivorous, entangling planktonic food through a mucous web that can be up to 5 cm wide, many times larger than themselves. If disturbed, they abandon the net and flap slowly away. When descending to deeper water, they hold their wings up. Sometimes, they swarm in large numbers and can be found washed up in flotsam, especially along the coast of eastern Australia. Thecosomata are the most common (in terms of diversity, species richness, and abundance) in the top 25 metres (82 ft) of the ocean, and become rarer the deeper one samples. They migrate vertically from day to night, so the community structure changes on a 24-hour cycle; during the day many organisms take refuge at water depths in excess of 100 m. They range from the tropics to the poles. Every day, they migrate vertically in the water column, following their planktonic prey. At night they hunt at the surface and return to deeper water in the morning. This is, geologically speaking, rather a young group, having evolved from the Late Paleocene in the Cenozoic Era. The group is represented in the fossil record from shells of those groups within the clade that mineralized. These shells are a major contributor to the carbonate cycle, making up as much as 12% of global carbonate flux. However the low stability of their aragonitic shells means that few end up being preserved in sediments, these being in shallower waters of the tropical oceans. These creatures, which range from lentil- to orange-sized, are eaten by various marine species, including a wide variety of fish that are, in turn, consumed by penguins and polar bears. The sea butterflies form the sole food source of their relatives, the Gymnosomata. They are also consumed by sea birds, whales, and commercially important fish. However, fish can get "black gut", rendering them unsaleable, if sea butterflies are consumed in large quantities. The superfamily Limacinoidea becomes redundant and the family Limacinidae becomes part of the superfamily Cavolinioidea. The families Creseidae and Cuvierinidae become the subfamilies Creseinae and Cuvierininae. The infraorder Pseudothecosomata becomes the superfamily Cymbulioidea. The superfamily Peraclidoidea becomes redundant and the family Peraclididae is included in the superfamily Cymbulioidea as the family Peraclidae. ^ a b c Lalli, Carol M; Gilmer, Ronald W (1989). Pelagic snails: the biology of holoplanktonic gastropod mollusks. ISBN 978-0-8047-1490-7. ^ "theco-". Oxford English Dictionary (3rd ed.). Oxford University Press. September 2005. (Subscription or UK public library membership required.) Sub-entry: "thecoˈsomate, thecoˈsomatous adjs. [Gr. σῶµα body], belonging to the Thecosomata"
^ Klussmann-Kolb, A.; Dinapoli, A. (2006). "Systematic position of the pelagic Thecosomata and Gymnosomata within Opisthobranchia (Mollusca, Gastropoda) - revival of the Pteropoda". Journal of Zoological Systematics and Evolutionary Research. 44 (2): 118. doi:10.1111/j.1439-0469.2006.00351.x. ^ a b c d Hunt, B. P. V.; Pakhomov, E. A.; Hosie, G. W.; Siegel, V.; Ward, P.; Bernard, K. (2008). "Pteropods in Southern Ocean ecosystems". Progress in Oceanography. 78 (3): 193. doi:10.1016/j.pocean.2008.06.001. ^ Comeau, S.; Gorsky, G.; Jeffree, R.; Teyssié, J. -L.; Gattuso, J. -P. (2009). "Impact of ocean acidification on a key Arctic pelagic mollusc (Limacina helicina)". Biogeosciences. 6 (9): 1877. doi:10.5194/bg-6-1877-2009. ^ a b c d Seibel, B. A.; Dymowska, A.; Rosenthal, J. (2007). "Metabolic temperature compensation and coevolution of locomotory performance in pteropod molluscs". Integrative and Comparative Biology. 47 (6): 880–891. doi:10.1093/icb/icm089. PMID 21669767. ^ Murphy, D.; Adhikari, D.; Webster, D.; Yen, J. (2016). "Underwater flight by the planktonic sea butterfly". Journal of Experimental Biology. 219: 535–543. ^ a b c Parra-Flores, A; Gasca, R (2009). "Distribution of pteropods (Mollusca: Gastropoda: Thecosomata) in surface waters (0–100 m) of the Western Caribbean Sea (winter, 2007)". Revista de Biología Marina y Oceanografía. 44 wrong (3): 647–662. doi:10.4067/s0718-19572009000300011. ^ "Sea Butterfly". Our Breathing Planet. Retrieved 12 October 2016. ^ Bé, A.W.H. ; Gilmer, R.W. (1977). Ramsey, A.T.S. (ed.). "A zoogeographic and taxonomic review of euthecosomatous pteropoda". Oceanic Micropaleontology. London: Academic Press. 1: 733–808. ^ Janssen, AW (2008). "Heliconoides linneensis sp. nov., a new holoplanktonic gastropod (Mollusca, Thecosomata) from the Late Oligocene of the Aquitaine Basin (France, Landes)". Zoologische Mededelingen. 82 (9): 69–72. ^ Lokho, K; Kumar, K (2008). "Fossil pteropods (Thecosomata, holoplanktonic Mollusca) from the Eocene of Assam-Arakan Basin, northeastern India". Current Science. 94 (5): 647–652. ^ van der Spoel, S. (1976). Pseudothecosomata, Gymnosomata and Heteropoda (Gastropoda). Utrecht: Bohn, Scheltema & Holkema. pp. 484 pp. ISBN 90-313-0176-0. A.W.H. Bé and R.W. Gilmer. 1977. A zoogeographic and taxonomic review of euthecosomatous pteropoda. pp. 733–808 In: Oceanic Micropaleontology, Vol. 1. A.T.S. Ramsey (ed.). Academic Press, London. S. van der Spoel, 1976. Pseudothecosomata, Gymnosomata and Heteropoda (Gastropoda). Utrecht (Bohn, Scheltema & Holkema): 484 pp., 246 figs. Cainozoic Research, 2(1-2): 163-170, 2003: regarding the raising of ranks. "Sea Butterfly". Our Breathing Planet. Retrieved 12 October 2016. Wikimedia Commons has media related to Thecosomata.